Sometimes you get lucky. I had seen this book before at the bookstore, but I passed it up. Lately, though, I’ve been bingeing on Black Ops 3 on the old Xbox Uno, and I thought the future warfare offered up by Unbreakable might dove-tail with that game. In some ways, it does. But here’s why I got lucky. 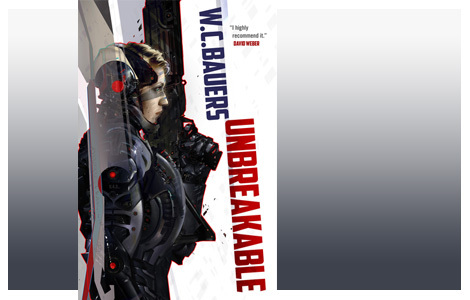 Unbreakable, by W.C. Bauers, is a character-based story first and space opera second. It’s not an excuse for pages of sci-fi shoot ‘em ups. There is a lot of action, but it’s all through the eyes of a unique and fascinating character. Subtitled “The Chronicles of Promise Paen,” Unbreakable follows the character Promise as she goes from family tragedy to enlisting with the Republic of Aligned Worlds Marine Corps (RAW-MC). But if you are expecting a Starship Troopers-style story about boot camp, you are mistaken. The author goes past that rather quickly to get to the real story, where Promise is thrown into the fire when she is assigned a mission to help repel pirate raids on her home world of Montana. She wasn’t chosen on accident. Montana is on the outer reaches of the Republic and Promise will serve as a liaison between the planet and RAW. Unfortunately, the rival Lusitanian empire has their sights set on annexing Montana for themselves, and the pirate raids may only be a cover for a deadly game in the cold war between the two galactic powerhouses. There’s some serious future combat here (hence my Black Ops 3 reference), and it’s well done. There is incredible violence, but also real moments of suspense. The author doesn’t glorify the violence, though. Both sides are presented as human, though one side is obviously “bad” given the way they operate. Nonetheless, the horrors of war are on display as much as the high-tech weapons, from naval-style space battles between massive ships, to ground assaults. There’s also a heavy political side, as the leaders of Montana try to navigate the path between the two warring parties and come out as unscathed as possible. The political machinations are drawn with a lot of color. So is everyday life on the outer planet. The “About the Author” section states that Mr. Bauers lives in the Rocky Mountains and I think he brings some of that love of the outdoors to his fictional planet. Montana isn’t just a set piece. Of course, Promise Paen winds up in the middle of all this. My only complaint would be that the character growth feels a little stunted, like she almost got there, but not quite. There are unresolved issues, which is fine because there is a sequel out there that I’ll read down the road. But I wanted to feel a little more growth. However, this complaint is so minor that I feel like a particularly harsh college English teacher, and I am in no way qualified for that position.